I have mumbility 1 and I join mumble 100% of the time. Since there are dozens of people posting here with bogus mumble bans, and probably dozens more who have bogus mumbility hits but haven't noticed the bans yet, it would be a good idea to relax mumble penalties while you figure out the problems. While retrieving all active bans, the system was matching on both SteamID and IP. That last bit caused the problem: if you have a house mate, who is likely to have the save IP, you're going to get the ban as well. So there will be no more issues? There will always be corner cases, but at this stage we can confirm that the system works for more than 99,9% of the time. However, people with fast changing dynamic IP's are likely to have a problems, due to matching between in-game and Mumble. Is there a way to find out if the system detects me to be in Mumble? Yes, there is. When the Lobby is launched, a Mumble-connection status indicator will be shown. If that is green, you may assume you won't get any cooldown issues. I have deafened myself; does this count as being in Mumble? There will always be corner cases, but at this stage we can confirm that the system works for more than 99,9% of the time. I won't even ask how you arrived at this figure. Of the 6 profile urls in this thread, it looks like 2 were addressed by your fix. naknak, both of those profiles were fixed before the update. This update wouldn't have changed the mumbility levels anyway. Out of 5206 unique IPs in Mumble over the last 4 days, only 6 players complained in this thread. That's more than 0.1% and of course this isn't the only thread. There are a handful more in the unban requests forum, plus who knows how many (I know of at least 2) who have the problem but are just waiting out their bans. And a lot of people won't notice right away. If they play 2 lobbies per day with roughly half of them being Mumble-required, they may not even notice until level 4 or so. This means that 690 seconds were sampled from a match that took 951 seconds; that comes down to 73%, which is below a threshold. The cooldown was therefor justified. Well that's great, except I never left mumble early or joined late. I know mumble went down briefly (and not just for me) in at least one lobby. Maybe that added up to 4 minutes, I don't know. I think your system is better at detecting people who don't live in Europe, than it is at detecting people who ignore mumble reqs. Even if 10,000 people use it and it being the ones that lobby the most often are being affected, you shouldn't punish the people who are the biggest consumers. Removing the whole mumbility ban system until it is properly worked out would be the best option. Its not fair to anyone. I've never failed to be in mumble yet I've apparently been banned 3 times. I know one lobby that happened today had everyone get a mumble-required ban--I only remember it being upward. Please just remove the system. It's screwing virtually everyone on the site over in so many ways. 128.2 hrs last 2 weeks. Just got mumble ban from this lobby, along with yipyapper. Yipyapper's might make sense because he was originally on one team and subbed to the other team because engineer is easier to sub for than scout. But I was in the mumble the whole time, undeafened, unmuted, didn't switch spots. Edited by FrontLineBait, 14 November 2014 - 06:37 AM. Yes, you have been banned because you have joined Mumble lobby and didn't use Mumble to communicate. Attention all! This thread isn't a place for complaints about Mumble bans. If you are violating rules, you are getting the punishment. This thread is only for those who got banned for NO REASON and can provide proofs of it. I'm still trying to figure out why I got a mumble ban the other day... I'm wondering if possibly it was because I joined a sub slot and by the time i hit connect to server the lobby was already over, and maybe it didn't register me joining mumble? Does this sound possible? Say you join a mumble required sub spot and the game ends 10 seconds later before you can even connect to mumble. Or could it be that every maybe 4-5 lobbies mumble just disconnects in the middle of the game then starts rambling "so and so moved to 22758 blue" and so on. Does the current system count you as not in mumble if something disconnects mumble mid game? I guess my point is, I'm 99% sure that I was banned due to some random fluke.. However the ban seemed to only last like half an hour or something. @ Mother Tereza. I was playing with someone today in my lobby. The lobby did not show the green mumble icon, but they WERE in mumble. How/Why would this happen? Edited by slayer, 14 November 2014 - 11:24 AM. (...) it effects the people with the most lobbies the most apparently..
Where did you come up with that logic? i basically cant play tf2center anymore because of this problem..rip. What are you talking about? After last nights fix, your cooldown has been lifted. Stop blowing things out of proportion. It's pretty airtight. People who play the more lobbies have less time between lobbies. They are affected by this problem at lower mumbility than infrequent players. Pop quiz: assuming someone joins mumble all the time, what is the maximum rate of random mumble errors that will allow his mumbility to converge to zero, 19 times out of 20? This number directly affects how many people will have undeserved problems with mumbility. Do you know what it is? Every single one of us in that lobby was in mumble for the full time. How are we supposed to prove that we were, and please tell me why you defaulted to "you broke the rules" to him when every single one of us just happened to get bans after the lobby? Pretty unlikely that we were all breaking the rules at the same time. I don't mean to be rude, but based on how this problem and others in the past have been dealt with, it sounds like the admins don't like to admit when they are wrong. Please just remove the limitation with this whole mumble thing until someone clears everything up. It's ruining tf2c more than it's helping by a significant margin. 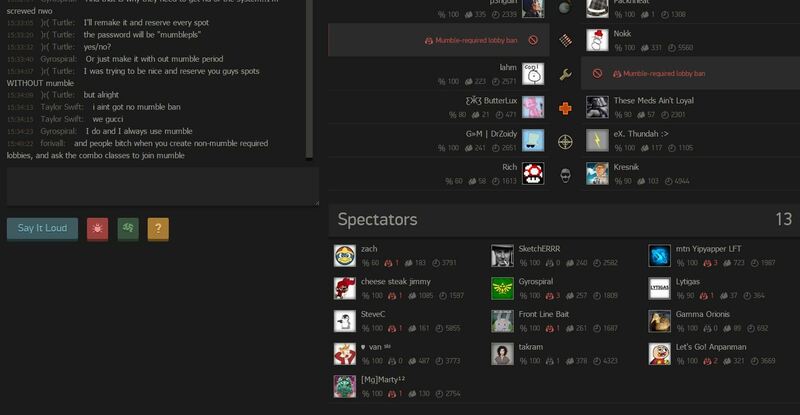 Look at all of the unban request forums. Look at everything going on here. There's a problem, you need to own up to it and fix it, and whether it gets fixed or not, needs to be temporarily removed. Agreed. I'm having the same problem. Says I skipped out 7 times when I know for a fact I've been in mumble every single time. I may have left prematurely on several occasions but definitely not 7. So I posted an unban request for mumble ban, and it was rejected (not important, not taking it harshly). But the reason it was rejected brings up an issue. Mumbility levels cannot be reset, other than playing 5 lobbies and joining mumble each time. Again, always check the icon. If it's grayed out, but you're in mumble, deafen / undeafen yourself, or disconnect / reconnect. That fixes the problem a lot of the time. If it still doesn't work after that, post in the bug sections with a mumble screenshot to prove that you were in mumble, and the lobby #. Well I generally want to start playing the game when everyone readies up. I don't pay attention to whether the mumble sign is greyed out or not, and why should I have to in order to avoid mumble bans? I want to join mumble, join the game, and go. It should work and do its intended job, or it shouldn't be implemented if it's causing wrongful mumble bans. If I'm in a mumble required lobby, in mumble, not deafened or muted (because I hate those kinds of people), then I shouldn't get a mumble ban. I can't really retroactively prove my innocence because I'm not a time traveler and didn't know I would be falsely banned. I can understand there being bugs in the system, but I don't think that it's okay to play "guilty until innocent" if neither side can prove guilt/innocence in the situation. If your side is saying I'm not in mumble when I am, then the bug prevents real proof. If I'm not recognized as "in mumble" then I don't find out until after the fact, and can't screenshot evidence of being in the mumble. Another problem about this, is that it affects players who play frequently the most. They're at higher risk of mumble bans if they're constantly playing lobbies. When the regulars stop playing, that's a big problem. I see naknak in lobbies very often, along with yipyapper, indust, route (might've had legitimate mumble bans, don't know) who've all been in mumble every time I see them and still get mumble bans. The good thing about the system, however, is that people who previously joined mumble-req lobbies and didn't join mumble are now actually punished for it, so it's not like I want the feature removed. I hope it's fixed soon. Edited by FrontLineBait, 15 November 2014 - 05:07 AM. Firstly, regarding your case. My reply was intended for Anpanman ONLY. I have no idea whom else you are talking about. There were given no profiles links neither nicknames. We aren't magicians and can't read minds. According Anpanman's report I have checked his Mumble status in those lobby and made my conclusions. Now I see that according your report, Mumble status icons are showing the incorrect info. But from Anpanman's report this conclusion couldn't be made. So remember in the future, always give us as much detailed information as possible, including your personal IDs. Secondly, I know that a lot of players are simply complaining about new Mumbility system, because they want to keep playing Mumble lobbies, while ignoring Mumble completely like they always did in a past. This era is ended. I understand why they unhappy now. And I want to say for all such players, the main goal of Mumbility - increase the quality of Mumble lobbies and filter dickheads ruining fun of others. So from now you have to choose: do you want to play a good lobby with comms or merely have a fun in regular non-Mumble lobby. He: Why I got banned!? I was in Mumble. I: Did you mute yourself? I: Did you deafen yourself? He: Yes, I was deafening myself 3 times during the lobby, because I got phonecalls. I: Well, no surprise why you got banned if you have been deafened half of the game. He: YOUR MUMBILITY IS CRAP! I WAS IN MUMBLE! REMOVE MY BANS! Do you see this retarded logic? This is a typical complaint among the REAL bug reports. That's why I have asked you to filter your complaints. Nobody is going to ignore obvious bugs. We will look into it, of course. You just need to be patient and give us intelligent information instead of hysterical shouts. Nobody is going to ignore obvious bugs. Naknak, it would be level 2. It takes 5 lobbies to decrease a level.